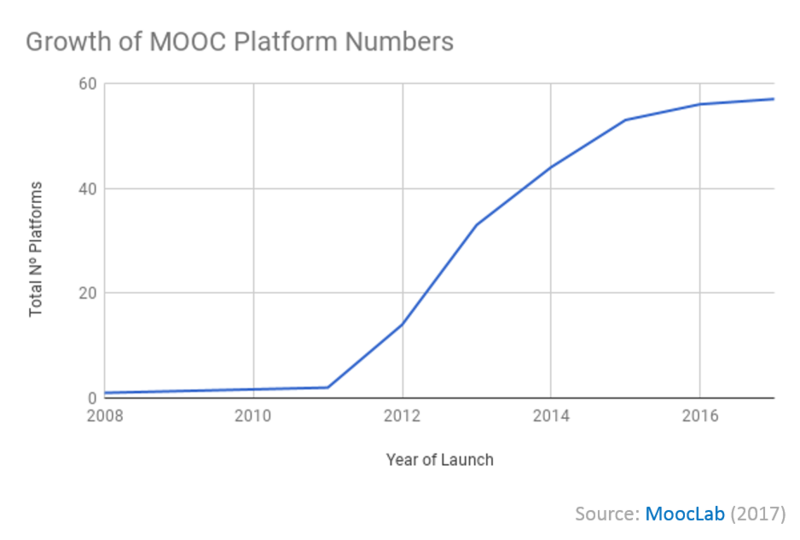 Since the launch of the first 3 major MOOC platforms in 2012, we have seen numbers growing year on year reaching a total of 57 MOOC platforms by the end of 2017 according to numbers collected by MoocLab. 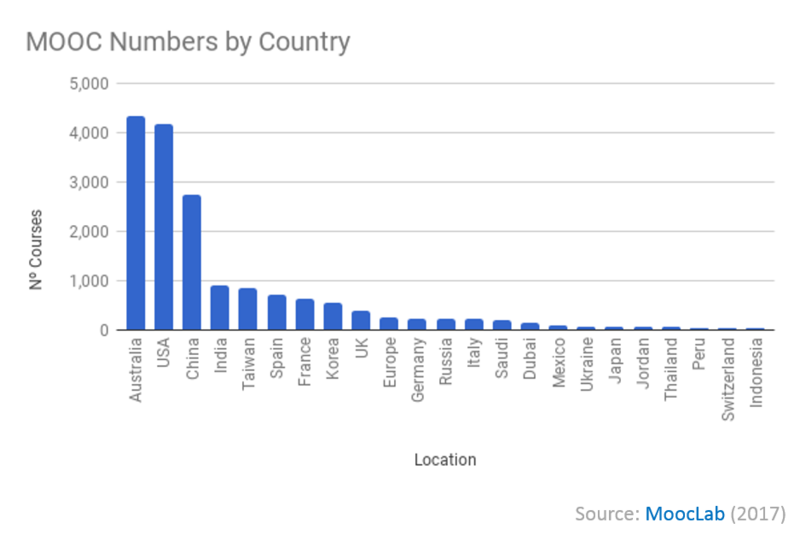 Based on user numbers obtained for 29 out of the 57 platforms, we can estimate the total global number of MOOC users to be in excess of 100 million learners worldwide. 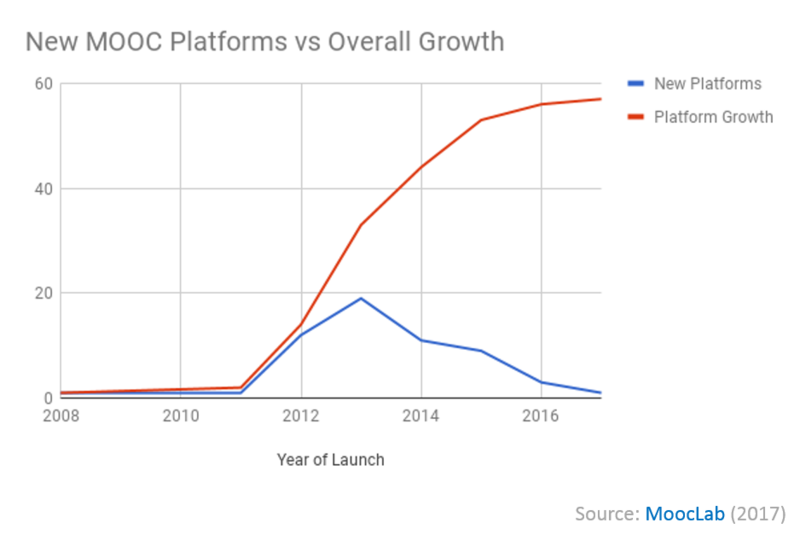 89% of today’s MOOC platforms were created between 2012 and 2015, with a surge in 2013 which saw the launch of 19 new MOOC platforms across the USA, Europe, Asia and Australia. 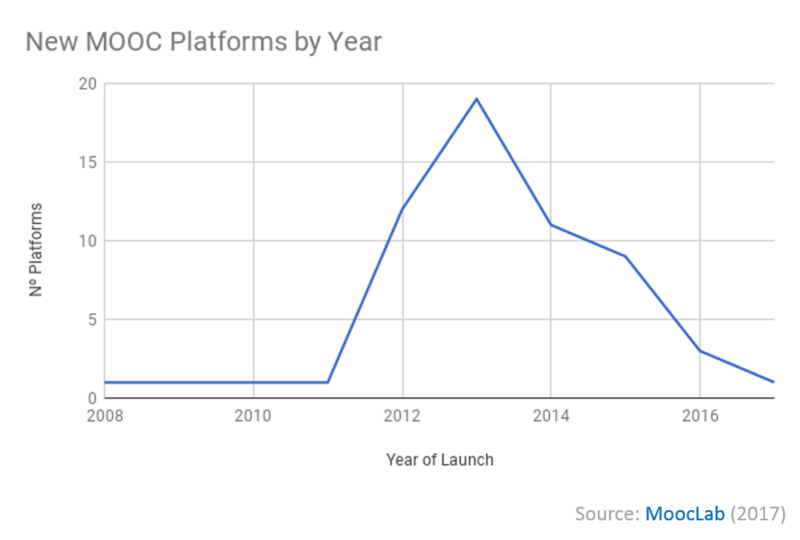 Although the number of MOOC platforms has grown by over 300% since 2012, there has been a 95% decrease in the number of year to year new initiatives since they peaked in 2013. 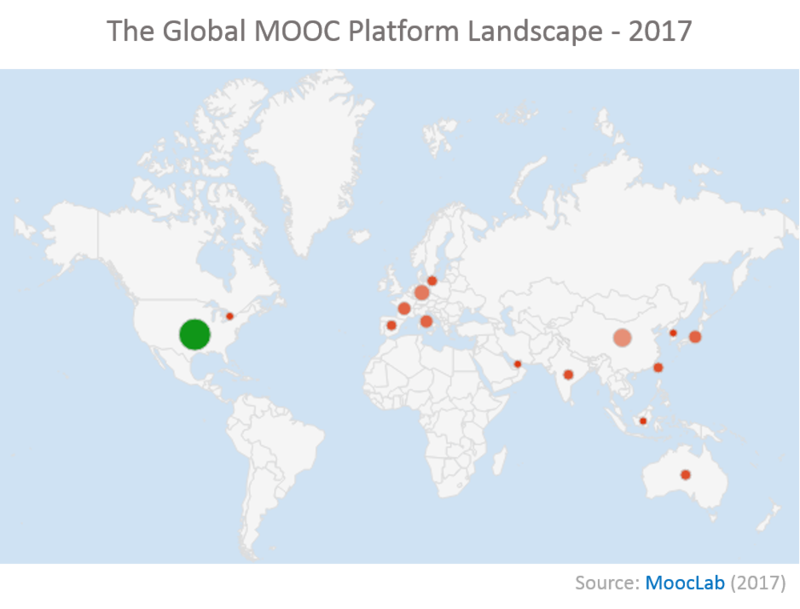 Over the last 5 years, we have seen the emergence of MOOC platforms across the globe, notably in Europe (34%), North America (32%), Asia and The Middle East (30%), and Australia hosting 2% of all MOOC platforms. Where the number of courses is concerned, Asia and The Middle East is in the lead with 37% of all courses offered globally of which China offers 16% with its 2,730 MOOCs. Australia’s MOOC offering represents 29% of all MOOCs followed by North America (18%) and Europe (16%). Looking at individual countries, MoocLab found MOOC offerings across 23 countries. Australia hosts the highest number of courses compared to any other country, representing 26% of the global MOOC offering delivered primarily through a single MOOC platform, OpenLearning, which offers over 4,300 courses. The 17 MOOC platforms based out of the USA together provide 25% of all courses with over 4,100 courses, followed by China with over 2,700 courses delivered through 5 platforms, representing 16% of all courses. Other countries offering MOOCs are Germany, France, Italy, Japan, India, Spain, Taiwan, Dubai, Indonesia, Jordan, Korea, Mexico, Peru, Russia, Saudi Arabia, Switzerland, Thailand, UK, and Ukraine. The English language dominates the MOOC offerings with 81% of MOOC platforms offering MOOCs in English. Spanish (28%) and Chinese (19%) are the second most common languages used in the delivery of MOOCs followed by German and French at 16% each, Portuguese (14%) and Japanese (12%). Other languages include Russian, Italian, Arabic, Portuguese, Hindi, Indonesian, Korean, Thai and Ukrainian. According to figures obtained from the 57 MOOC platforms, the total number of MOOCs offered across the global MOOC landscape amounts to over 17,000 courses. All the platforms listed provide free access to either all or some of their courses. 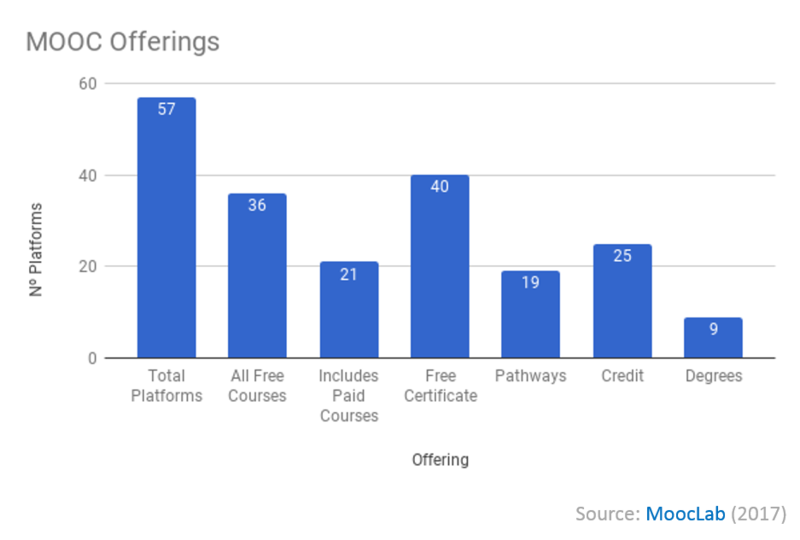 An investigation into the different offerings revealed that 63% of MOOC platforms don’t charge for any of their courses, although there may be a fee for obtaining a course certificate, and 70% offer free certification. 33% offer course pathways - series of related courses leading to a more in-depth learning outcome, and 44% offer credit either in the form of transferable university credit or CPD points. Currently only 16% of MOOC platforms offer degrees. 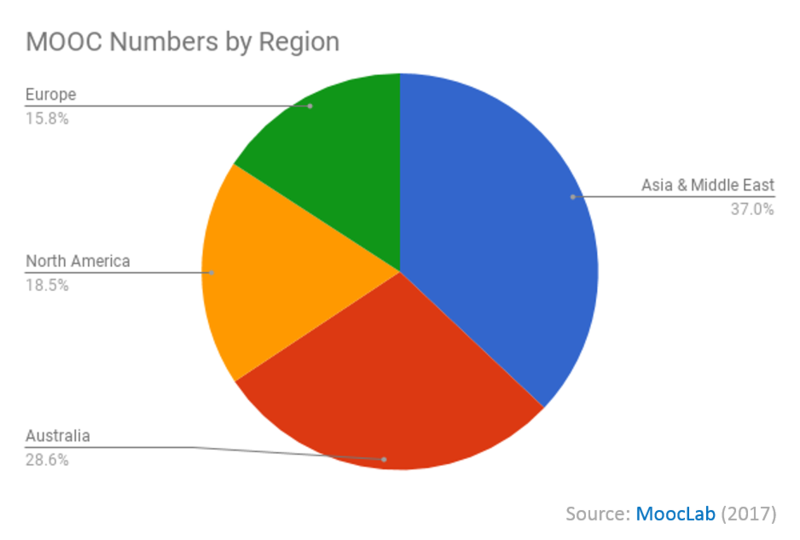 This study into the current MOOC landscape shows some encouraging signs in the geographical and language diversification of MOOCs with offerings found across North America, Europe, Asia, The Middle East and Australia. There is a gaping hole, however, where it comes to the African and Latin American continents. For MOOC platforms to exist, there must also be the provision of the courses that populate them and these are known to carry heavy costs to produce and run. This obstacle no doubt partly explains the lack of MOOC platforms in poorer parts of the world. One of the main drives behind the original MOOC movement was to provide free higher education to those without means or access. 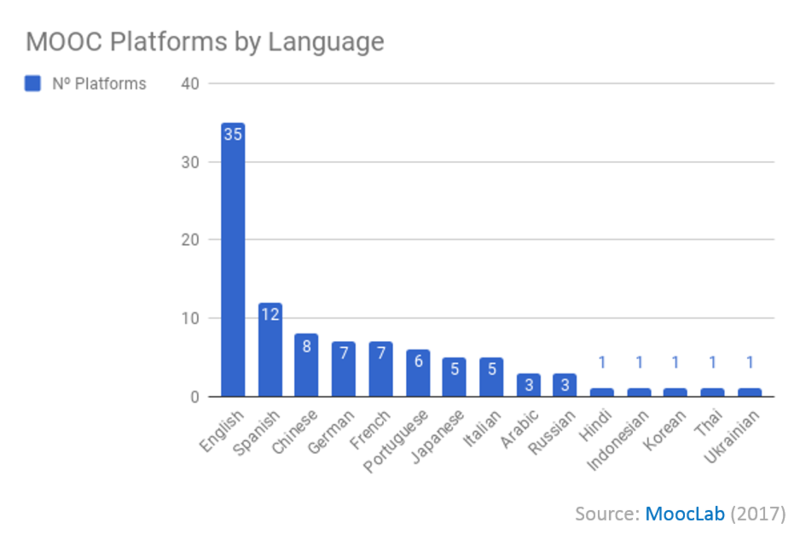 Language barriers to top MOOCs continue, however, to be prevalent with the vast majority of courses being run in English. Although some work is being done to deliver MOOCs that cater to different languages and cultures, more needs to be done in this direction to ensure this form of education becomes a learning tool for all populations.